I've told you guys before about the beautiful woodwork my dad has done. Now that my parents moved out of state into a smaller house, his garage workspace is significantly smaller than the workshop he used to have. Fortunately, he still has room for some tinkering. 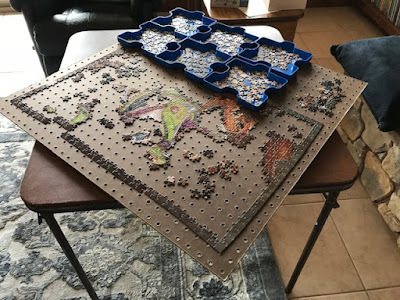 He sent me photos of his latest creation, a rotating tabletop for jigsaw puzzles, thinking I might want to share it with you all. Here it is, sitting on top of a card table. To work on another section of the puzzle, simply rotate the tabletop. Cool idea! Here are the plans in case you'd like to make your own. This is the underside. The felt pads are there so it doesn't harm the table underneath it. This is what the top looks like when there isn't a puzzle on it. Obviously, you could paint it whatever color you want. 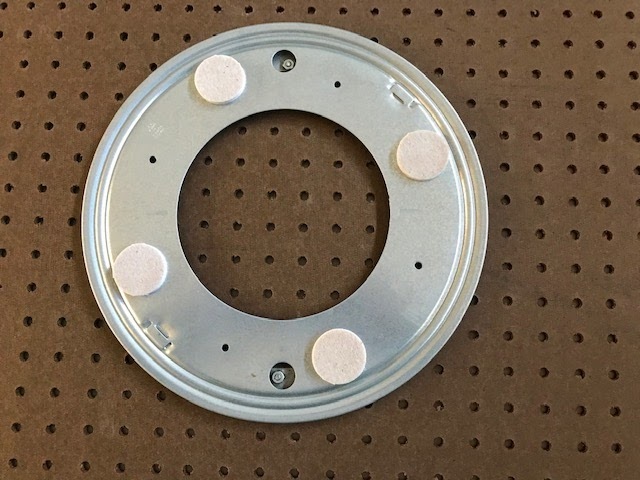 You could use a solid board instead of pegboard if you want a smooth tabletop, but the finished product will be a lot heavier. As is, it's about 7 pounds, making it easy to move and store. Dad also gave me the cost breakdown. He found everything at Lowe's. Let me know if you end up making your own rotating puzzle tabletop. Thanks for sharing your design, Dad! That is GENIUS!!! Your Dad is AWESOME!!!! !